DISCOVERY Join a full-day Guided Visit to the magical Black Forest to experience the Vogtsbauernohf open-air-museum, visit an authentic water mill, and see a traditional butter-making demonstration. 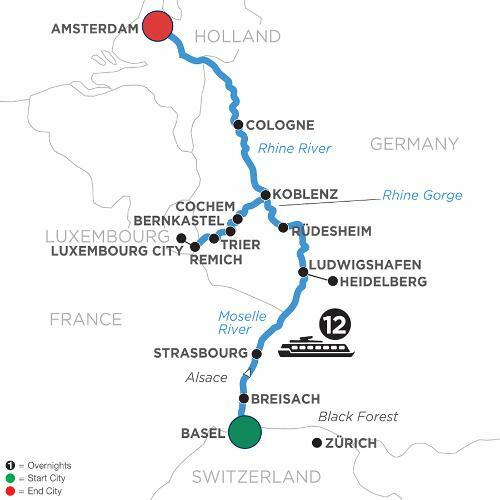 Embark on this exciting river cruise in Basel, Switzerland, and explore everything the Moselle and Rhine Rivers have to offer as you stop at interesting and unique cities in France and Germany—and end in lively Am-sterdam, Holland. At the foot of Kaiserstuhl Mountain on the French-German border sits Breisach—known to be the gateway to Germany’s famous Black Forest, an area of unrivaled natural beauty. Continue your river cruise to Strasbourg, France, where a local expert will show you the red-sandstone gothic cathedral with an-cient murals and fascinating astronomical clock. Visit the ruins of Heidelberg’s castle, towering magnificently over the city, then head for the charming Rhine Valley wine town of Rüdesheim. Sail through the dramatic Rhine Gorge, considered the most beautiful view of the Rhine River, and see an-cient castles standing majestically on cliffs 400 feet above the water. Visit Koblenz, strategically located at the confluence of the Rhine and Moselle Rivers, before coming to the charming wine village of Bernkastel! Here, you’ll go on a guided walk and taste some of the famed Moselle wines! Visit a medieval castle, then sail back into the Rhine and explore the magnificent city of Cologne, Germany, which straddles both sides of the Rhine River. Your river cruise vacation ends in marvelous Amsterdam where there is much to see! Discover the treasures of this popular, historic city on a canal cruise which takes you through the elegant Grachten lined with stately homes dating back to the city’s “Golden Age.” Don’t miss your chance to discover the treasures you’ll cherish along the Rhine and Moselle Rivers! Gateway city for arrival is Zürich, Switzerland.